I swear I wasn’t going to go. I wanted a break after all the wedding planning this year. The only reason I went is because I saw a rendering of this piece called Minaret by my all-time favorite artist Bryan Tedrick. I am in love with the guy. I was practically stalking him at the party celebrating the Honorarium artists. The first night we got there, we walked over to this amazing art installation and there was the artist watching people climb his work. “OMIGOD, Bryan Tedrick,” I screamed. 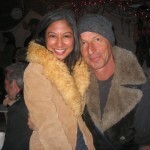 “You’re the reason I came to Burning Man! I wasn’t going to come, but I knew this was going to be so amazing! I had to be here!” I’m pretty sure I freaked him out. I did scale up 50 feet to the domed top. The upward trek was very challenging and scary. I actually went 15 feet up, then made my way back down because the hooks where you should be placing your hands aren’t easily apparent. 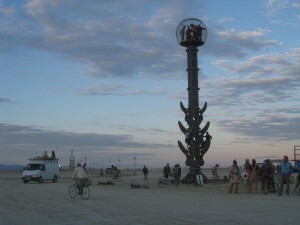 After I went back down and sulked, someone on the Burning Man staff promised to be my spotter. So, yes, I made it safely to the top! Here I am posing absolutely star-struck with my favorite artist.